Image Comics/Skybound is pleased to announce that THE WALKING DEAD #163 by Robert Kirkman and Charlie Adlard, INVINCIBLE #133 by Robert Kirkman, Ryan Ottley and Nathan Fairbairn, and OUTCAST BY KIRKMAN & AZACETA #25 by Robert Kirkman, Paul Azaceta, and Elizabeth Breitwieser, will all hit stores this February 2017 with a $0.25 price point in celebration of Image Comics’ 25th anniversary. THE WALKING DEAD #163 begins an all-new story arc and readers are met with the aftermath of the Whisperer War. Ryan Ottley returns as artist on INVINCIBLE #133 just as “THE END OF ALL THINGS” begins. This 12-part mega-story will touch every corner of the INVINCIBLE universe, and when it’s over… IT’S OVER. Every single story for the past 13 years has been leading up to this last finale story arc. OUTCAST BY KIRKMAN & AZACETA #25 begins an all-new story arc as well and provides a major turning point in the series. New characters are introduced and big things are in store for Kyle Barnes as he’s faced with something he never could have prepared for—hope. Everything changes in this 25th issue, for $0.25, in celebration of the 25th anniversary. 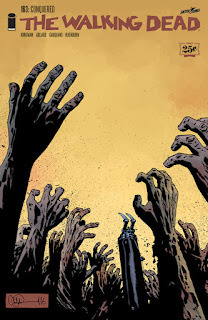 THE WALKING DEAD #163 will be available on Wednesday, February 1st. INVINCIBLE #133 will be available on Wednesday, February 15th. OUTCAST BY KIRKMAN & AZACETA #25 will be available on Wednesday, February 22nd.